In 2008, a few years after Hurricane Katrina, school officials in Louisiana asked aspiring charter-school leader Andrew Shahan to consider taking over the failing Dr. Charles Drew Elementary School in New Orleans’ Upper 9th Ward. Shahan submitted a 170-page application, outlining his plans for Drew, which he renamed Arise Academy, an acronym for the school’s key values: Achievement, Respect, Innovation, Service and Enthusiasm. 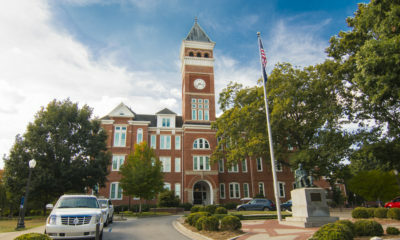 In his application, Shahan predicted that Arise’s test scores would increase by 10 percent each year over the course of five years, starting at 40 percent “proficiency” on state tests and stair-stepping up each year, until its students reached 80 percent proficiency in the school’s fifth year. 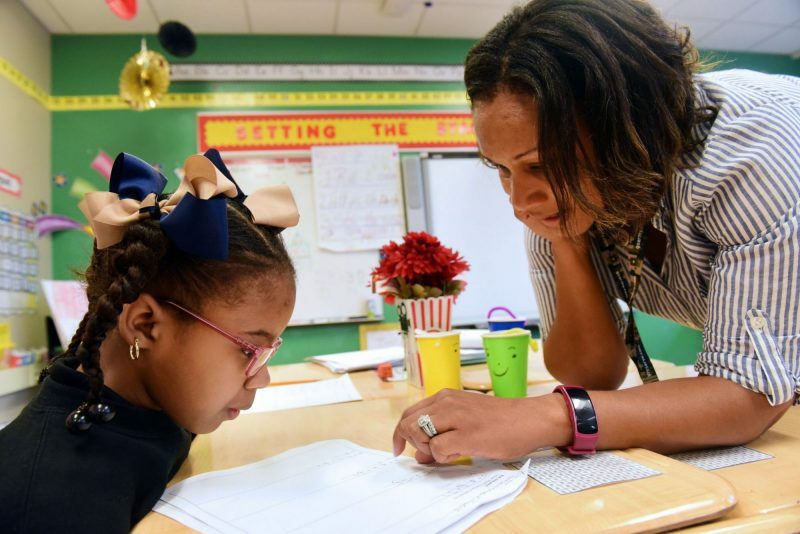 A Hechinger Report analysis found that such lofty goals were common in the 10 years after Hurricane Katrina, particularly between 2008 and 2013, when dozens of new charter schools opened across the city. For this story, reporters analyzed every available open-enrollment charter application approved between 2005 and 2015 — the decade after Katrina. Open enrollment schools are open to all students who live in the city, regardless of street address or skill level. At Arise, the school whose name begins with Achievement, not even 40 percent of students were proficient in 2016, based on composite scores for English and math. Of the dozen or so school leaders interviewed for this article, not one had a definitive answer for why the projections were so inflated. They tended to cite a combination of their own optimism coupled with pressure from state officials, who in turn were pressured to meet the federal educational goals set in No Child Left Behind. Indeed, some charter operators said that they set unrealistic targets because they thought it necessary to win approval for their charters. Without overly ambitious goals, “I don’t think that there’s a snowball’s chance in hell that our charter would have been approved,” said Mickey Landry, executive director of the Choice Foundation, which now runs two charters in the city. Related: Is school choice helping or hurting Catholic schools in New Orleans? Defenders of the projections say the goals were made in good faith but that some factors proved to be out of the schools’ control. Educational consultant Leslie Jacobs, a former member of the state Board of Education, notes that growth predictions that fell short likely were dragged down by students who had attended low-performing schools before 2005 and then returned to classes in New Orleans after missing months, even years, of schooling. “People didn’t understand the low academic scores our kids had when they were walking in the door after Katrina,” said Jacobs, recalling how the state scrambled to open enough schools for the thousands of students returning from displacement in Texas and other states. “The rebuilding of New Orleans and the rebuilding of the schools in New Orleans was in many ways, ‘Ready, fire, aim,’” she said. 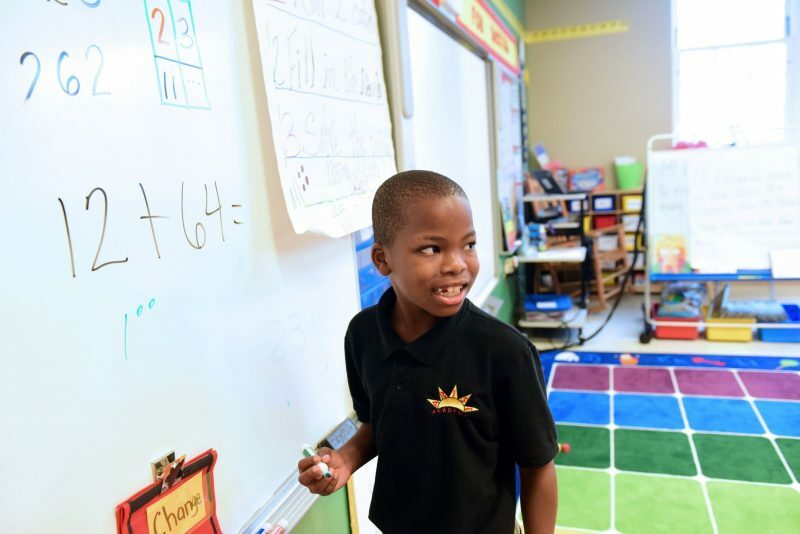 Shahan arrived in New Orleans almost a decade ago with visions of launching a brand-new bilingual immersion school with kindergarten only and adding one additional grade each year. Instead, the state requested that he take over the failing Drew school. 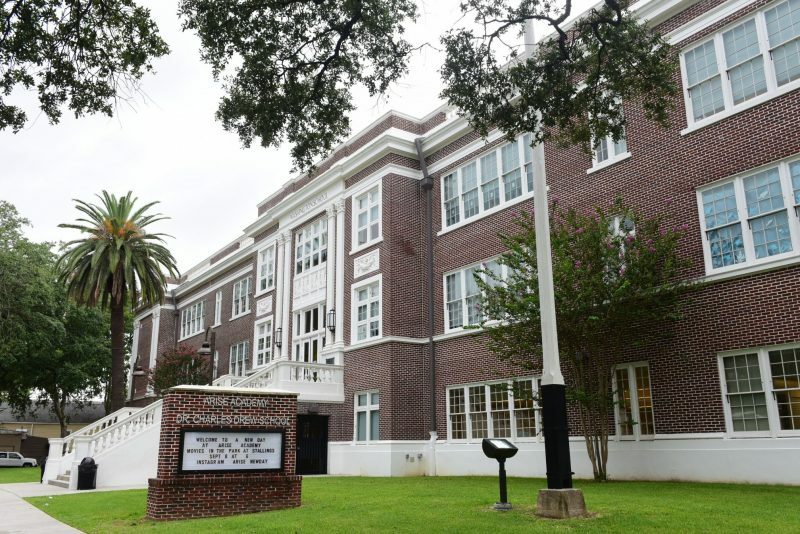 “The city was like the Wild West then,” said Shahan, noting that, despite the disorder in the surrounding city, students at Arise reached a peak of 62 percent proficiency and a C rating in 2013, at which point Arise received a five-year charter renewal and took over a second campus, Mildred Osborne Elementary in eastern New Orleans. Other charter operators made promises that they knew, from the start, they couldn’t keep. Mickey Landry said a “very aggressive” staffer at the Louisiana Department of Education pushed him and his board chair into projecting 10 percent annual growth for Lafayette Academy, the first school the network opened. Though Landry can’t remember the administrator’s name, he can see still her face as she told him and his board chair to push predictions far beyond their comfort level. “She expected much more than ‘You’re going to meet state standards,’” he said. That meeting and its demands “lived in our muscle memory” during subsequent years; Choice Foundation submitted a few more applications with similarly inflated projections, hoping to charter more schools, Landry said. State Board of Education spokesman Kevin Calbert said the 10 percent number was based on the improvement the state needed to make to meet federal No Child Left Behind standards, which required 100 percent proficiency by the year 2014. The No Child Left Behind targets, set in 2001, became more flexible in 2011, after U.S. Department of Education officials estimated that 82 percent of schools would fall short. Ken Campbell, who was director of charter schools for the Louisiana Department of Education between 2007 and early 2010, agreed that federal mandates likely had something to do with it. No one from his staff pushed such goals, he said, suggesting that a state compliance officer may have done so. Esperanza, which has done well under Choice leadership, achieved 67 percent proficiency in 2016, but is still not at its 80 percent target. One irony of all this lofty — and unrealized — goal-setting is that it really doesn’t matter. Once the Board of Elementary and Secondary Education (BESE) approves charters in Louisiana, the applications are generally set aside and ignored. Though some states consider applications to be contracts and hold schools to the standards they set out, spokespeople for both the Recovery School District and BESE said that in Louisiana the applications serve more as exercises in goal-setting and planning. When charters are up for renewal, Louisiana requires them to demonstrate operational and financial health and a modest 5 percent annual academic growth, typically measured during the year that the charter is up for renewal. Some charter leaders say high targets were needed for aspirational, if not always realistic, reasons. FirstLine Schools, a charter network comprised of five schools, chose 80 percent proficiency as its “big hairy aspirational goal” in post-Katrina applications, said Jay Altman, who heads up the network. By the end of the 2016-17 school year, all four of FirstLine’s elementary schools had reached 60 percent proficiency in either science or math. A few classes at Langston Hughes, one of the network’s schools, had nearly reached 100 percent, a fourth-grade class at the network’s Phyllis Wheatley school reached 90 percent, and numerous classes had hit 80 percent proficiency, Altman said. “So 80 percent has served as a good bar,” Altman said. But as the FirstLine team was writing applications, Altman remembers debating whether they should shoot for 100 percent proficiency. “Some said, ‘We need to say 100 percent even if we can’t make it,’” he said. “Just because of the psychology of targets.” The idea is that if the goal is less than 100 percent, some students can be pushed to side, viewed as non-achievers. 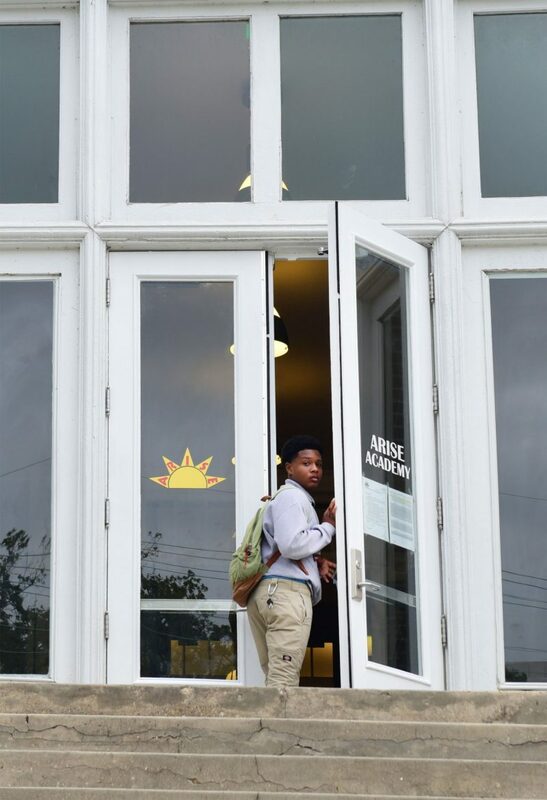 Generally, in its post-Katrina applications, KIPP New Orleans, which now has seven charters organized as 11 primary, middle and high schools, projected 75 or 80 percent proficiency for its students. Those projections were not far off. Results from 2016 show that two of its four K-8 charters had some scores in the 70s in either English or math and one of the others was a few points shy of 70 percent proficiency. The last was struggling to reach 60. But in its 2010 application for KIPP Leadership Academy, submitted before the state stiffened its testing standards, KIPP predicted that 100 percent of fourth graders would reach mastery, the step above proficiency. Spokesman Jonathan Bertsch, director of advocacy for the network, said that after studying other New Orleans schools and demographically similar KIPP schools in other cities, 100 percent seemed realistic, given the assessments and conditions of the time. “We always want to set goals that are high, even if we fall a little bit short in reaching them, rather than setting goals that that aren’t good for kids but are achievable,” Bertsch said. Looking at it from the other end of the spectrum, educational consultant Andre Perry (who writes a regular column for The Hechinger Report) worries that if the bar is set too high, some open-enrollment schools may feel pressure to raise scores by finding “nefarious ways” to eliminate low-performing students through increased suspensions, expulsions, so-called “pushouts,” and pre-admission screening. “If I had submitted more realistic numbers, the state would have never accepted it,” said Perry, who believes that the state needs to be more realistic about the students it serves. “There’s a general belief that you have to shoot for the stars or you’ll be shortchanging a possibility of miraculous growth,” he said. Some charter applicants who submitted realistic projections now wonder if their applications were rejected partly because of that. In 2010, Cheryllyn Branche, then a celebrated principal at Benjamin Banneker Elementary, submitted an application to charter her school that predicted around 7 percent growth. She set the bar as high as she thought practical. “I fudged as far as we thought we could,” she said, noting that she had run Banneker as a school that truly took all comers, including more than 20 percent special needs students. During interviews for this story it became clear that some state Board of Education members never saw the projections, because they only read summaries of the actual applications, which often are hundreds of pages long. Jacobs said she relied on reports written by independent evaluators from the National Association of Charter School Authorizers (NACSA). Those evaluators scrutinized each application and conducted interviews and site visits before making a recommendation. NACSA’s endorsements were sent to the state superintendent, who generally approved them and sent them on to BESE for a vote. William Haft, who headed up NACSA’s New Orleans evaluation team for a few years during the post-Katrina period, said that while there was no requirement that charters make sky-high test score projections, it didn’t hurt. Hechinger Report recently published an article about local open-enrollment charter schools falling short of the achievement targets leaders set when they opened their doors in the decade following Hurricane Katrina. When strong leaders set goals for their teams, they are often aspirational, as was pointed out by several school leaders quoted in the article. These goals also reflected the context of an era where 100 percent student proficiency was set as an ambitious, but unrealistic, national goal. But the fact these schools didn’t achieve their originally stated goals does not diminish the undeniable progress of students enrolled there, and to suggest so is unfair. From 2005 to 2015, the period examined in the article, academic outcomes for public school students in New Orleans, measured by standardized tests and school performance scores, significantly improved, with the percentage of historically disadvantaged students scoring proficient on state tests making notable strides. Once near the bottom in performance statewide, New Orleans students have nearly closed the achievement gap with their peers. As one example, prior to Hurricane Katrina, only one-third of all New Orleans elementary and middle school students were proficient—scoring Basic or above—on state assessments, far below the statewide average of 57 percent. Ten years later, 63 percent of New Orleans students were proficient, a remarkable gain of 30 percentage points. Similarly, the percentage of African-American students scoring proficient on state tests increased 27 percentage points, from 32 percent to 59 percent during this time, effectively closing the gap with the state average and outpacing their peers. New Orleans’ high school graduation rate also increased from 54 percent to 73 percent and the percentage of students enrolling in college the fall semester following high school graduation rose by nearly two-thirds. The academic progress these students have made in the wake of Hurricane Katrina is inspiring and proves beyond a doubt that when you raise expectations for all students, they can achieve great things. It also demonstrates that we can go and must go further, as there is still undoubtedly more progress to be made. Until then, we should focus our energy on supporting our school leaders—and more importantly, their students—as they work to sustain and grow that extraordinary progress over time. Caroline Roemer is the Executive Director of Louisiana Association of Public Charter Schools. A reply from Sarah Garland, Executive Editor of The Hechinger Report. Thank you for raising the larger issue about charter-school performance over the first post-Katrina decade. The larger, citywide performance was perhaps not emphasized to the level that it could have been and we appreciate you raising it. We are familiar with the statistics you raised, since they come from the Hurricane Katrina 10th anniversary report issued by the Recovery School District. Given the story’s focus on Type 5, open-enrollment charters, we wanted to note that the data you cite includes higher-performing Orleans schools that weren’t part of the state takeover. Recovery School District New Orleans received its own report card for the 2014-15 school year. In it, 53 percent of students were proficient, 12 points below the statewide average. The graduation rate of 61 percent for RSDNO students was also significantly lower than the statewide rate of 75 percent. The report also notes that 50 percent of RSDNO schools had letters grades of D or F.
Certainly, the city’s charters schools overall have shown impressive gains, as noted by researchers from CREDO, among others. But we believe that the piece that we published is better set in the context of the tougher struggles seen within the RSDNO. For the city’s lowest-performing schools that seem stuck at the D and F levels, it seems especially appropriate to ask tough questions about goals reached and unreached.